An animated comedy series exploring the tru-ish adventures of President Donald Trump and those closest to him. In this parallel cartoon universe, the Commander-in-Chief opens the White House doors for an “all access” look at a typical day for the President of the United States. 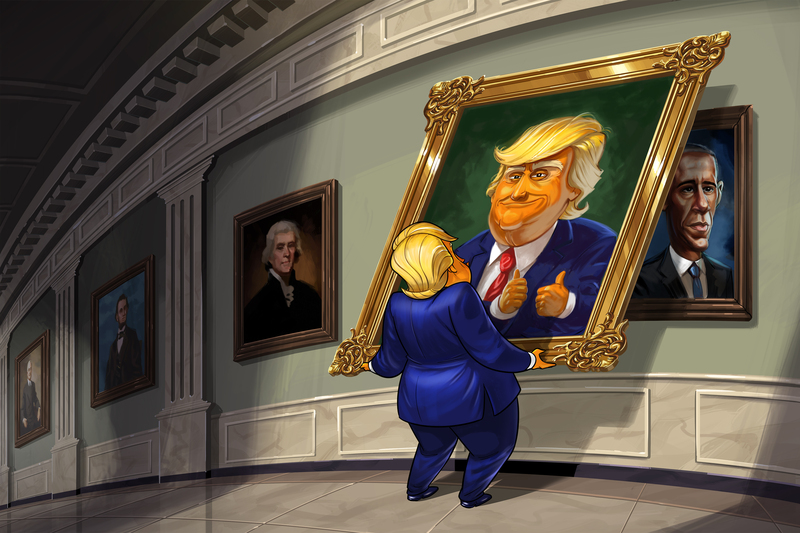 A satirical look at Trump’s day-to-day life, OUR CARTOON PRESIDENT examines the quintessentially Trumpian details of the presidency and his most important relationships, and no one is safe – from his close family and confidants to key political figures and members of the media. The series is produced by CBS Television Studios and executive produced by Stephen Colbert, Chris Licht and R.J. Fried. Tim Luecke, who co-created The Late Show with Stephen Colbert version of the animated Trump, will serve as lead animator (and co-executive producer). Emmy® and Peabody Award-winning host Stephen Colbert took over as host of CBS’ The Late Show on September 8, 2015. Best known for his Comedy Central show, The Colbert Report, Colbert is also a best-selling author and accomplished actor, writer, producer and comedian. On September 17, Colbert hosted The 69th Annual Primetime Emmy Awards on CBS. In 2017, The Late Show received three Emmy nominations for Outstanding Variety Series, Outstanding Writing for a Variety Series and Outstanding Directing for a Variety Series. The Late Show also earned a nomination for a 2016 Writers Guild® Award for Outstanding Comedy/Variety Talk Series. In addition to the three Emmy nominations for The Late Show, Colbert and his staff also received three 2017 Emmy nominations for the live election night special he hosted on SHOWTIME, STEPHEN COLBERT’S LIVE ELECTION NIGHT DEMOCRACY’S SERIES FINALE: WHO’S GOING TO CLEAN UP THIS SH*T? From its debut, The Colbert Report was a critical and cultural success, winning two Peabody Awards and earning 37 Emmy Award nominations. The series won the Emmy for Outstanding Writing for a Variety, Music or Comedy Program in 2008, 2010, 2013 and 2014. Prior to hosting The Colbert Report, Colbert spent eight years as the longest-tenured correspondent on The Daily Show with Jon Stewart. Colbert began his career in television after graduating from Northwestern University and joining Chicago’s famed Second City improv troupe. It was there he met Amy Sedaris and Paul Dinello, with whom he created and starred in the half-hour sketch comedy series Exit 57. The trio went on to create the live-action narrative series and cult hit Strangers with Candy. Also, Colbert was a cast member and writer for the variety series The Dana Carvey Show and a writer for Saturday Night Live. His television acting credits include guest roles on The Mindy Project, House of Cards, The Office, Curb Your Enthusiasm and Law and Order: Criminal Intent. A celebrated author, Colbert contributed to “America (The Book): A Citizen’s Guide to Democracy Inaction,” which topped “The New York Times” bestseller list for 15 consecutive weeks. His first solo book, “I Am America (And So Can You! ),” spent 29 weeks on “The New York Times” bestseller list in 2007, debuting and occupying the No. 1 spot for 13 weeks. His second book, “America Again: Re-Becoming The Greatness We Never Weren’t,” released in October 2012, spent 17 consecutive weeks on The New York Times” bestseller list and earned him a Grammy® Award in 2014 in the category of Best Spoken Word Album for the audiobook. In May 2012, Colbert released his first children’s book, “I Am A Pole (And So Can You! ).” Also, he co-authored the critically acclaimed book “Wigfield.” In September 2017, Simon & Schuster (a division of CBS Corporation) released “Stephen Colbert’s Midnight Confessions,” a book and audio edition based on Colbert’s popular “Midnight Confessions” segment on The Late Show. In 2010, Colbert received three Emmy Award nominations and won a Grammy Award for Best Comedy Album for “A Colbert Christmas: The Greatest Gift of All!,” the album from his one-hour musical holiday special on The Colbert Report. In 2011, Colbert starred as Harry in the New York Philharmonic’s presentation of Stephen Sondheim’s Company. More than an entertainer, Colbert has drawn on his comedic talents to impact culture in extraordinary ways over the past decade. In 2011, he was granted permission by the Federal Election Committee to organize his own Political Action Committee, “Americans for a Better Tomorrow, Tomorrow” that drew attention to issues surrounding campaign finance. In 2009, The Colbert Report traveled to Iraq on a USO Tour titled “Operation Iraqi Stephen: Going Commando” to tape and perform shows in front of the troops, becoming the first television show in USO history to produce a full week of shows in a combat zone. In 2007, he launched a brief presidential bid but withdrew after being denied a place on the ballot of the South Carolina Democratic Party. The success of The Colbert Report allowed Colbert to lend his name to things such as a Ben & Jerry’s ice cream flavor, (Americone Dream); a Virgin America jet, (Air Colbert); and a NASA treadmill called the Combined Operational Load Bearing External Resistance Treadmill (C.O.L.B.E.R.T.). Colbert Nation sponsored the U.S. Speed Skating team for the 2010 Olympics. Raised in South Carolina, Colbert currently lives in New Jersey with his wife and three children. His birthday is May 13. Follow him on Twitter @StephenAtHome. Licht served as a producer on The 69th Annual Primetime Emmy Awards, hosted by Stephen Colbert, on CBS in 2017, when The Late Show was nominated for three Emmys: Outstanding Variety Series, Outstanding Writing for a Variety Series and Outstanding Directing for a Variety Series. In addition, The Late Show staff received three nominations for the live election night special hosted by Colbert on SHOWTIME, STEPHEN COLBERT’S LIVE ELECTION NIGHT DEMOCRACY’S SERIES FINALE: WHO’S GOING TO CLEAN UP THIS SH*T? Under Licht’s guidance, CBS This Morning became CBS’ most successful morning newscast in more than two decades, generating CBS’ largest audience in the time period in 23 years during the fourth quarter of 2015. During Licht’s tenure as executive producer, CBS This Morning earned a prestigious Peabody Award, two News and Documentary Emmys and one Daytime Emmy. Also, the broadcast and Licht were honored with two Alfred I. DuPont-Columbia Awards, the first as part of CBS News’ division-wide coverage of the shootings at Sandy Hook Elementary School in Newtown, Conn., and the second for a series of reports on Europe’s migrant crisis. Licht joined CBS News from MSNBC with a wealth of experience in television news. He was the co-creator and original executive producer of MSNBC’s Morning Joe and was at the helm as the show garnered critical acclaim for its interviews with newsmakers and perspective on the top news stories. In addition to covering nearly every important news event in recent history, Licht led the show’s comprehensive on-location coverage of the 2008 election. Before Morning Joe, Licht was a senior producer and then executive producer of Joe Scarborough’s Scarborough Country on MSNBC. Licht began his career at KNBC in Los Angeles, distinguishing himself early on during the O.J. Simpson trial. Over the next seven years at KNBC, he moved up to special projects producer, coordinated the station’s Olympics coverage, and then produced the Channel 4 News at 11 In 2001, NBC moved Licht to the San Francisco Bay area, where he played an integral role on the transition team during the network’s purchase of KNTV. Following the transition, he remained with the station as executive producer. Licht’s first book, “What I Learned When I Almost Died,” was published by Simon & Schuster, a division of CBS, in May 2011. A three-time Emmy nominee, R.J. Fried most recently served as co-executive producer and head writer for Problematic with Moshe Kasher His credits include Triumph's Election Special 2016, Maya & Marty, Late Show with David Letterman, Night of Too Many Stars, Onion Sportsdome, and The Last Word with Lawrence O'Donnell. He has written for Stephen Colbert, David Letterman, Jon Stewart, Conan O'Brien, Robert Smigel, Sacha Baron Cohen and Bill Murray, among others. He also performed in various bits on Late Show with David Letterman. Fried is a former two-sport NCAA Division I varsity athlete at Harvard University, and was drafted by the Florida Panthers in the third round of the 2000 NHL Draft. He was raised in Indiana, Pennsylvania. Follow him on Twitter at @rjfried.